Organizations can be constrained by the framework of conventional wisdom or they can seek to reposition their products and services. 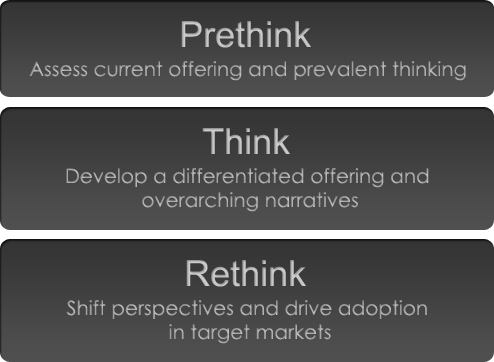 Rethink Partners uses a systematic business approach to identify and implement strategy options that shift buyer and industry perspectives. For our partners our goal is to improve the perceived price-value proposition, increase profitability and build accretive value. In total, the Rethink business approach is a practical, integrated collaboration that leads to impactful execution and launch. Our varied skill set allows us to plan and execute quickly and efficiently. We are partners, not consultants. Rethink Partners content is concise, impactful and inspires further engagement. Rethink Partners distributes content through mainstream book publishing channels as well as specialized targeted marketing channels. Rethink Partners e-books combine video, audio and text for a unique and engaging reading experience. The Rethink team brings extensive experience in business strategy, product management, sales and marketing, editorial, design and online implementation. Mark Pearlman is a business strategist, media executive, and non-profit activist in New York City. He draws on his substantial expertise in financial, marketing, and organizational leadership to work closely with a select number of investment firms. Most recently Mark was Executive Director of Business Strategy at The MDE Group, a pioneering wealth management firm with more than $1.3 billion in assets under management. With MDE, Mark developed and launched Risk 3.0™, an innovative investment solution platform and a unique approach to risk. Mark was part of the original executive team that launched the Fox News Channel under Roger Ailes in 1996. Previously, he held numerous management positions at CBS from 1978 to 1995 including Vice President, Business Development. He also helped build a Metromedia Company owned by John Kluge, where he held the position of Vice President, Market Strategy. Mark supports charitable causes through direct involvement with specific nonprofits. He is a former Chairman of the Children’s Museum of Manhattan and has funded and directed many Jewish community initiatives including the Jewish GDP Project and JInsider . Mark produced and directed the documentary film, A Travelers Guide for Uncertain Times (2008), a film highlighting spiritual wisdom following the financial collapse of 2008. In addition, Mark wrote a column for The Jewish Week, and has organized and sponsored a think-tank discussion with Jewish community leaders on the direction and goals of the community. Mark was also a Board member of the Annenberg Foundation initiative in New York City for the arts and education. Rethink has the expertise to execute in a wide range of practical fields, from editorial content and print design to online marketing and website construction. Our team is focused and results-oriented, producing all the elements required for high-quality, impactful initiatives in a time-efficient manner.